U.S. Ambassador to Hungary Colleen Bell speaking at Corvinus University in Budapest on October 28, 2015 (photo: origo.hu). Nine months after arriving to Budapest, United States Ambassador Colleen Bell voiced her first criticism of the Orbán government during an October 28, 2015 speech entitled “A Current Look at U.S.-Hungarian Relations” at Corvinus University in Budapest. Until this speech, Ambassador Bell, a political appointee and former television soap-opera producer, had conducted purely soft diplomacy, e.g., attending a rural festival with the agricultural minister, meeting with a popular young pianist and composer, planting trees on the square outside the U.S. embassy in Budapest and visiting a Hungarian Air Force base. Then, about half way through her speech, Ambassador Bell enumerated a long list of “U.S. concerns as we look at conditions in Hungary,” largely reviving the themes that her predecessor as the top United States diplomat in Hungary, Chargé d’Affaires André Goodfriend, had articulated in 2014. —and rehabilitation of anti-Semitic historical figures. The United States understands that Russia is an important energy supplier—it will continue to be important in the future. But Russia and all suppliers—including the United States, by the way—should compete at market rates, on market terms. No nation should be kept dangerously dependent on any single source for its energy needs. See entire abridged version of speech. 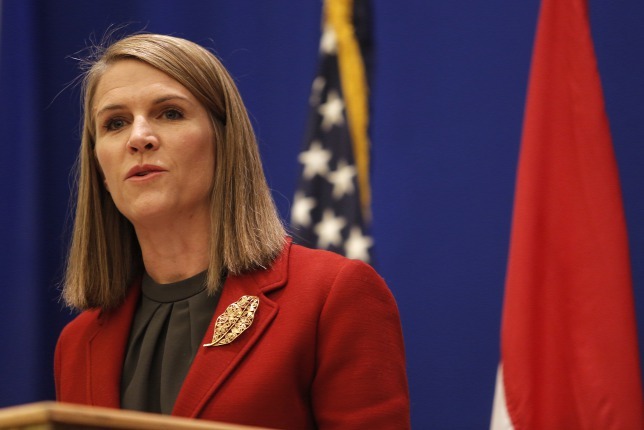 The criticisms that Ambassador Bell voiced in her October 28, 2015 speech at Corvinus University were uncommonly explicit and detailed for such a high-ranking diplomat toward the government of a nominally allied country. The Orbán administration reacted very sensitively to Ambassador Bell’s démarche: Hungary’s state-run media reported the speech only the following day, within the context of Minister of External Economy and Foreign Affairs Péter Szijjártó‘s rejection of the criticism articulated in it (source A and B in Hungarian). During his regular Friday-morning interview on Kossuth Radio on October 30, Prime Minister Viktor Orbán said with regard to Ambassador Bell’s speech that “This is realpolitik . . . this is naked national or imperial interest” (source in Hungarian). Ambassador Bell’s Corvinus University speech likely signals the end of a ten-month period of détente between the United States and the Orbán government and the return of the openly adversarial relations that existed between them when André Goodfriend served as the top U.S. diplomat in Hungary in 2013 and 2014.